Danielle Mitzman» Blog Archive » Surely not in Bologna la Rossa? Surely not in Bologna la Rossa? My friend Angela walked into my flat last Wednesday, visibly shocked. She’d been in a shop in the town centre when a commotion had made her turn to look outside. A car inviting citizens to vote for the extreme right party, Casa Pound, was driving by, flags waving and fascist anthem blaring. Angela’s voice trembled with anger: “20 years ago”, she fumed, “this could never have happened in Bologna”. 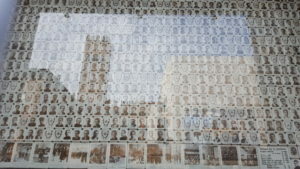 ‘Bologna the Red’, the city famed for its left-wing politics, the city where the wall of the old stock exchange, now the public library, is covered with photos of its partisans who died fighting Fascism. Angela was born in 1953, the year after the Scelba Law made ‘apologia del fascismo’ and any attempt to reform the Fascist party a criminal offence according to the Italian constitution. Yet here were fascists shamelessly campaigning in Bologna. The car Angela saw gained a certain online notoriety last week, not least for a video that went viral. It captured the (perhaps ironically) red Land Rover moving slowly through the mediaeval streets of the city centre, being chased by a cyclist shouting insults at it. Looking carefully at the shops and porticoes in the clip I recognized Via Sant’Isaia, the street at the end of my road. So the car had just gone past the Museum of the Resistance and Istituto Parri, the anti-fascist institute dedicated to the history of the liberation. Its director, Luca Alessandrini is a man with piercingly intelligent eyes and a moustache that joins seamlessly with his beard, obscuring his mouth but never his words. I call and remind him of a conversation we had soon after we first met. Unlike Germany, he said post-war Italy had never truly dealt with its fascist past, never fully taken responsibility for its role in Jewish persecution. For decades, school syllabuses avoided the Second World War: the uncomfortable facts swept under the carpet. Former partisans used to visit schools here to tell children their story; but today only a few are still alive. Does Luca think fascism could be creeping its way back into Italy? To some extent, yes. But not through voting for extreme right wing parties, which he doesn’t believe will happen. He’s more worried about the anti-immigrant rhetoric of the centre right which is, he says, “the real key to this electoral campaign”. Nationalistic slogans like Italia agli italiani – Italy for the Italians and Padroni in casa nostra – Masters in our own home are, he says, inherently fascist. Establishing a closed nation that defends its citizens through exclusion of foreigners was, he reminds me, part of the original Fascist ideology. Last Friday afternoon, Bologna’s main square suddenly filled with riot police. A rally for the far right Forza Nuova was scheduled to take place that evening in the little piazza behind the landmark basilica, while an anti-fascist crowd had already gathered to protest against them at the other end of the square. 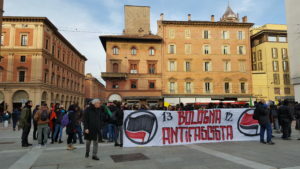 Their gigantic banner bore the simple slogan “Bologna antifascista”. Their megaphone boomed angrily, at times provocatively. I watched them together with the black and white partisans framed behind me on the library wall. The voice of fascism may have reared its head in Italy once more but here in Bologna the voice of anti-fascism is always at hand to drown it out. This entry was posted on Wednesday, February 28th, 2018 at 17:38 and is filed under Written Articles. You can follow any responses to this entry through the RSS 2.0 feed. Responses are currently closed, but you can trackback from your own site.